Here’s the only book dedicated to giving you the complete information that you need to become an effective Physician Assistant and maintain those high standards in practice. 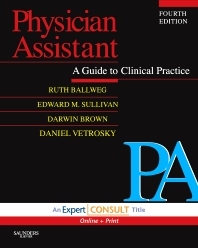 This up-to-date edition covers all aspects of the physician assistant profession, the PA curriculum, and the PA's role in practice, all in an easy-to-use textbook format that features convenient tables and clear illustrations, as well as case studies and clinical application questions. You’ll find this book invaluable throughout your course of study, when entering the job market, and as an excellent reference in clinical practice. And, with this Expert Consult title, you’ll be able to search the entire contents of the book, online, from anywhere. Covers all the core competencies that you need to master for year one or for recertification, so you can excel. Gives you the information you need on all of the rotations and practice areas that are open to you to help you make the right decisions.